Upright: Conflict, disagreements, competition, tension, diversity. Reversed: Inner conflict, conflict avoidance, tension release. In the Five of Wands, five men appear to be fighting each other, using their wands as weapons. However, on closer observation, their wands are raised but not striking or injuring anyone. It is as if there is no real purpose or outcome in this chaotic scene other than to create conflict and sow discord amongst the group. Each man wears a different outfit, symbolising their diverse backgrounds and belief systems, and suggesting that, because of their differences, they cannot find harmony and common ground with one another. In the Tarot, the Fives typically represent conflict and change, and the Five of Wands is no exception. This card indicates that you are in the midst of battle, tension, and competition with others and it is impacting your ability to move forward with your goals. Rather than being able to work towards a common goal, you are running up against constant opposition. 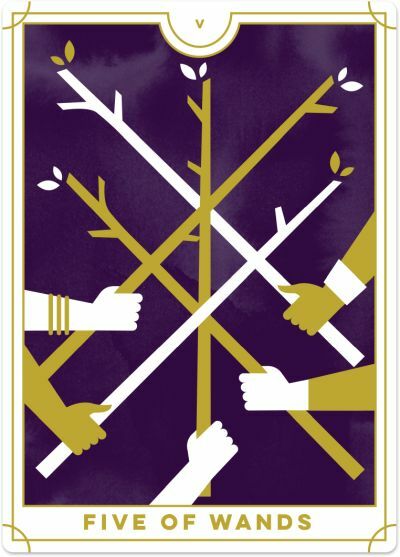 With the Five of Wands, everyone is fighting to be heard. But guess what? No one is listening. When everybody has a different opinion, but no-one is stopping to hear each other out, conflict and misunderstandings will run rampant. If you find yourself in this situation, see it as an opportunity to rise above the chaos and disorder. Take a moment to listen to what others have to say – even if you agree to disagree. The key is to tune in to one another and allow each person to make their case. And perhaps, in the process, their opinions may become softer and quieter. They may also give you the respect you’re seeking and listen to your viewpoint. Sometimes, this type of conflict and discussion can be very productive, such as with group brainstorming and problem-solving. You need a constructive environment where you can test your ideas and have them challenged (and improved) by others. You may benefit from establishing a working group, committee or mastermind group with other individuals who bring varying perspectives and experiences. Be open to this debate as a positive contribution to improving the quality of your ideas and actions. The Five of Wands also encourages diversity and differences of opinion. You may deal with people from different cultures and backgrounds and struggle to accept their way of living. Know that each person has something unique to bring to the table and that you will benefit by learning more about them and what they have to offer. The Five of Wands encourages an enthusiastic approach to change. Transition (or even transformation) is coming whether or not you like it; your challenge will be in ensuring that everyone is on the same page and dealing with this shift constructively and positively. Currently, your group’s energy is scattered by misdirected enthusiasm. Everybody has ideas, but no one is there to bring them into a logical path forward. Your role may be in identifying a clear strategy and purpose that can be implemented by all involved.. The Five of Wands reversed suggests that you are facing internal conflict and are unclear on where you stand on important issues. You may try to work through your point of view on contentious topics such as abortion, immigration, globalisation or the environment, or you may navigate personal issues such as whether to stay or leave a particular relationship or job. You have others around you who have strong views about what you should do and this is creating an enormous amount of tension and disagreement. Just when you think you have a clear perspective, someone challenges you on it, or you discover new information, and you change your standpoint again. This process is beneficial and will help you come to a well-researched and well-thought-out viewpoint. Know, too, that there is no right answer, and someone will disagree with the path you choose, so find the option that sits best with you. Align your head and your heart to discover a sense of peace within yourself. The Five of Wands reversed can suggest that you have the tendency to avoid conflict wherever feasible. You may find that any tension makes you feel uneasy, and you wish it would just go away. So, you deflect a lot of that energy and ignore the problem, if there is one. The trouble, however, is that in doing this you may just be pushing some of your concerns to the side without dealing with them or asserting your point of view. Some conflict can be useful, particularly if it is constructive and draws out the underlying issues in a way that then generates a better solution. Consider whether always avoiding such discomfort is the best way to go or if you are finding yourself compromising on what is important to you. The Five of Wands reversed is like a sigh of relief after a struggle. You are no longer up against so much competition and can just ‘be.’ On a more personal level, you have worked through your anger and hostility and feel more secure in your relationships. You do not have to prove yourself anymore.